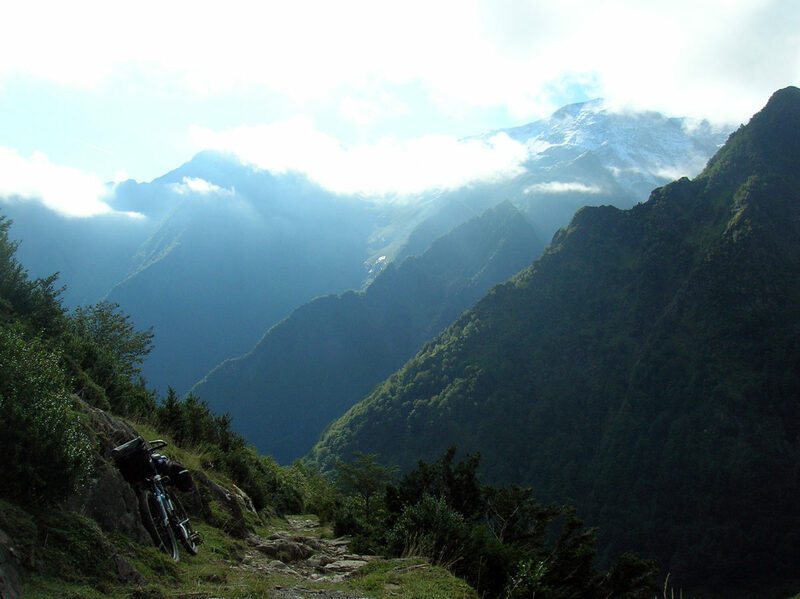 650 km 7/8 day ride across central and north west Spain, about 70% off-road. 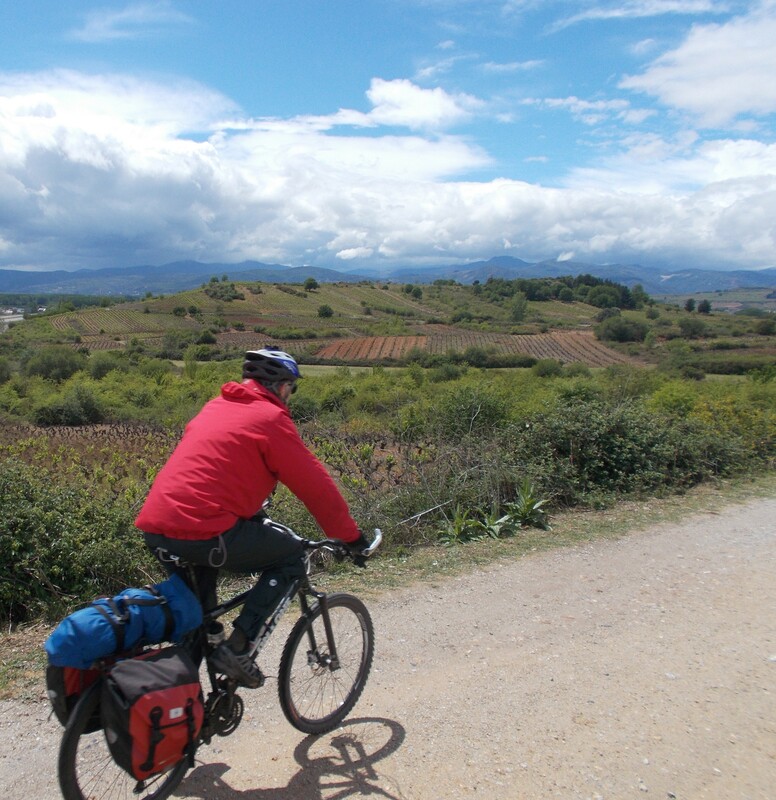 The Camino de Santiago is a famous pilgrimage route that also makes a great, mainly off-road cycle route. 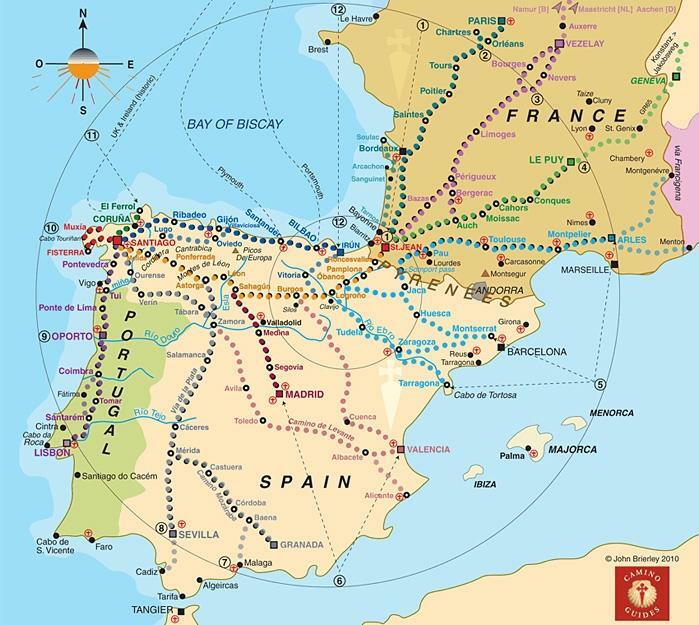 It’s worth noting that there is not just one Camino but a number of routes that all converge on Santiago – see the map further down the page. Last year I did another of these Caminos – the Via de la Plata, originally a Roman road that starts in Seville and finishes on the north coast of Spain. This year I wanted to finish in Santiago so decided to take the Camino route, that starts in Madrid. From Madrid we took the Camino Madrid which goes north for 320 km to Sahagun where it joins the Camino Frances, which is the main Camino route to Santiago. 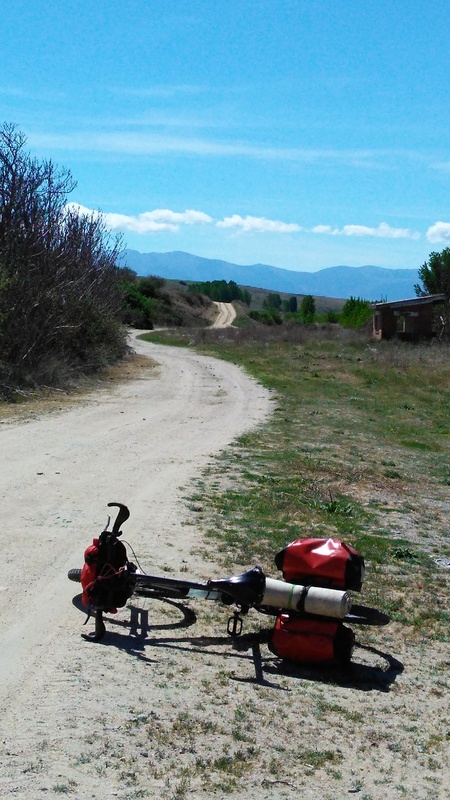 It is easy to get out of Madrid Airport – see practical info section below – and we soon were heading out over the mountains following the trail to Segovia from the village of Cercedilla (altitude 1,200m). This first section crosses the Sierra de Guadarrama on a sometimes steep and rocky trail, crossing a 1,796m pass before the descent to the beautiful city of Segovia with its Roman aqueduct. After Segovia the route climbs steadily on to the meseta – the rolling high plateau of central Spain which undulates between 800-1,000 m. This is sparsely populated land and the Camino follows dirt roads, sandy trails and stony tracks through woodland, pasture land and cornfields where you can ride for hours without seeing anyone. There’s a sense of space and openness in this part of the ride, with only the occasional hilltop village as a distraction from the wide horizons. 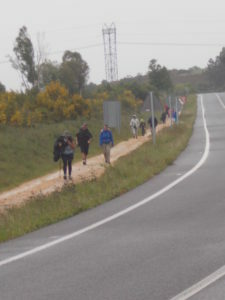 At Sahagun the Camino Madrid ends joins the Camino Frances which is the main Camino route to Santiago. The Camino Frances starts in the French Pyrenees and takes a route through Pamplona and Burgos, then into Galicia and finally to Santiago. 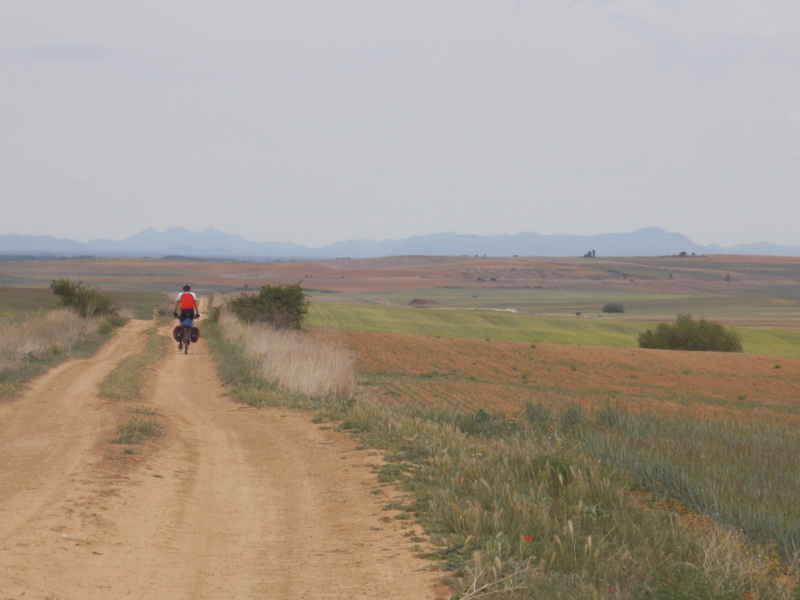 The contrast with the Camino Madrid is immediate. 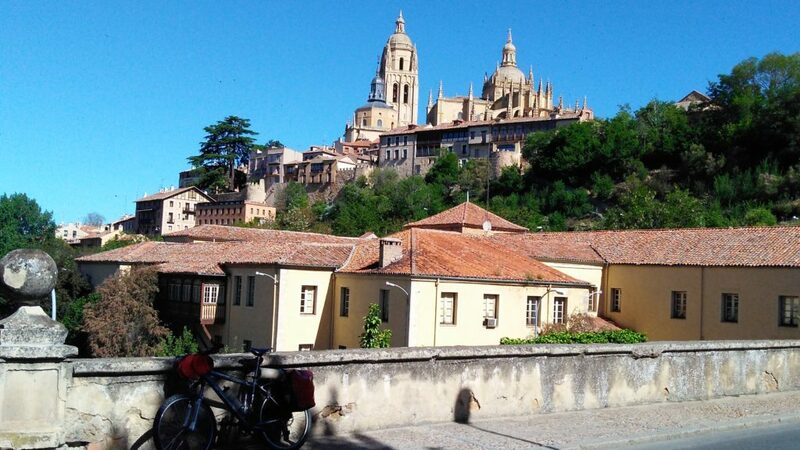 In terms of landscape the meseta is left behind and the Camino passes through a more populated area going through the city of Leon and the towns of Astorga and Ponferrada. 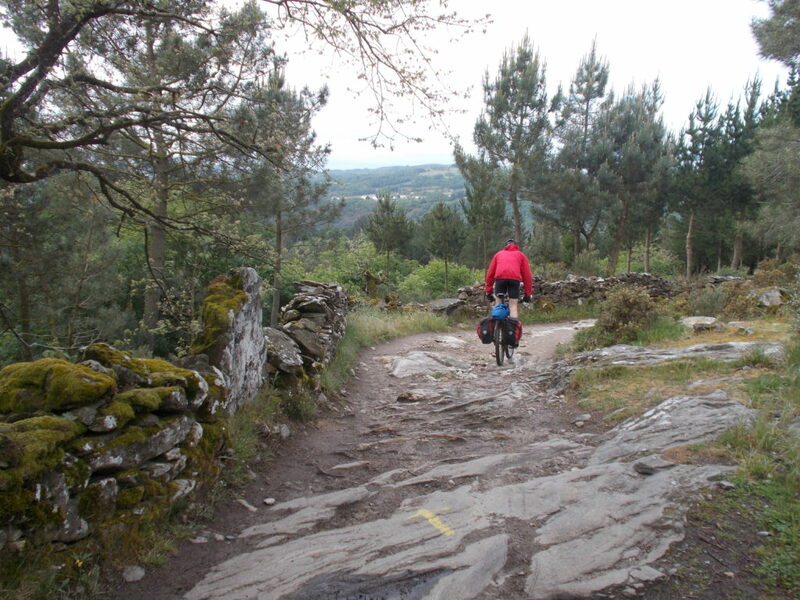 For part of this section the Camino runs parallel to the main road but on a bike you pass through it fairly quickly and are soon into Galicia proper. 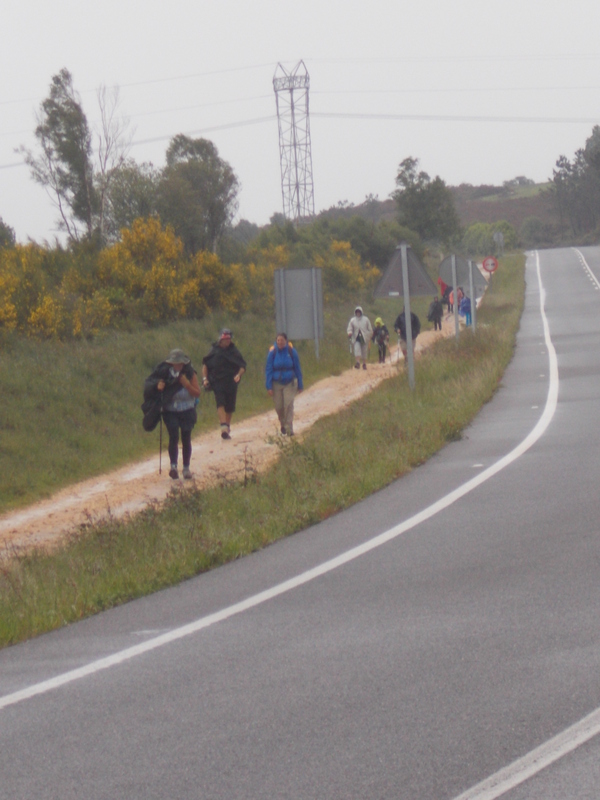 The other noticeable change when you join the Camino Frances is the number of people walking and cycling to Santiago.It is busy. There’s a steady stream of pilgrims (peregrinos) along the route and the hostels (albergues) can be quite full. We rode the route in early May and was quite busy then, so in the peak summer season finding accommodation without booking could be problematic. Most campsites only open from June to August and there are not that many along the route so you have to rely on albergues. 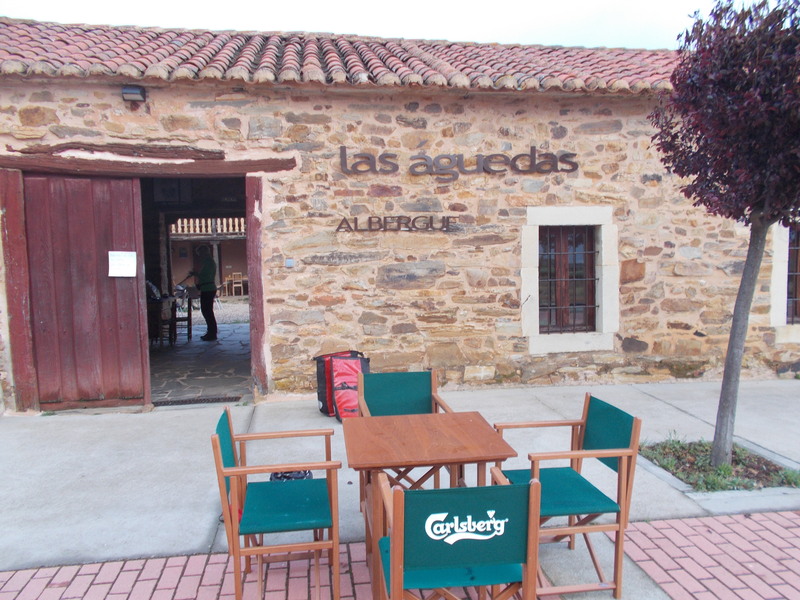 So, from Sahagun the Camino is busier, more sociable, you’re sharing your evenings with people of all ages from around the world and there are more facilities geared towards the peregrinos, particularly cafes and restaurants and accommodation. The flip side of this camaraderie can be the increased volume of snoring in the dormitories! After Astorga the landscape, and often the weather, changes. 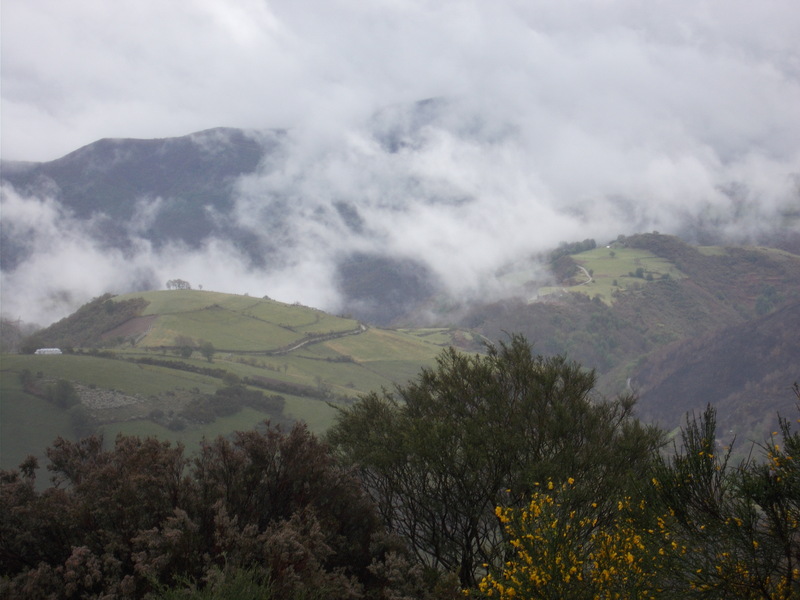 Galicia is hilly, wooded and verdant with a maritime climate that can bring rain at any time of year. For anyone from the UK, it’s reminiscent of the mountain areas of Wales. It’s a great contrast to the earlier parts of the route both in terms of terrain and landscape. The last four or five days of riding to Santiago can be quite tough, with a lot of height gain, together with some rocky sections of trail. It was quite wet and windy when we did this section and so it was quite a contrast to the 30 degree temperatures we had experienced north of Madrid. The route finally takes you into the heart of Santiago and the impressive square in which the cathedral is located. There is a sense of shared achievement when you reach this point with hundreds of other peregrinos also arriving. 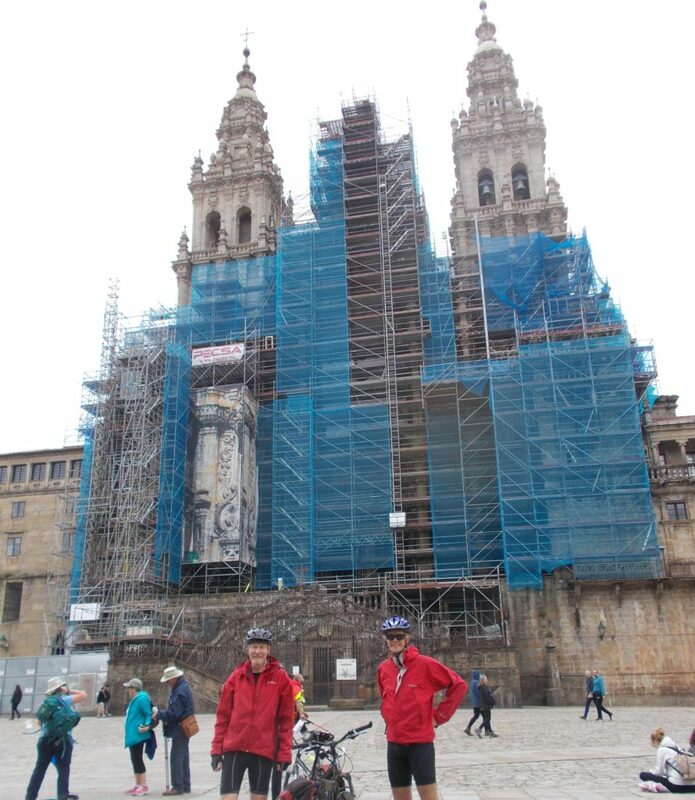 Unfortunately the cathedral was shrouded in plastic sheeting which makes it slightly less imposing! Outward to Madrid: Ryanair flies from Stansted; Easyjet from Gatwick. Madrid Airport is easy to get out of as the Metro from airport allows bikes on the trains(not at peak times) to suburbs or to main rail stations. The Metro departs from all airport terminals. Take the Metro Line 8 from the airport and change at Nuevos Ministerios Metro station. Take Line 10 north to Madrid Chamartin railway station if you want to take the train out of Madrid to Cercedilla a village on the Camino Frances. The local trains are called Regional or Medium distance trains – and take bikes without booking. The rail website RENFE is not easy to use if you’re looking for smaller stations – search for trains from Madrid to Segovia, then from the list of trains listed click on the slow trains to see the timetable. Alternatively you can pick up the Camino Madrid track in the Madrid suburbs at Fuencarral. Again Line 10 Metro is the route you need. Return from Santiago. Ryanair flies to Stansted; Vueling & Easyjet to Gatwick. Santiago Airport has very easy access by bike. Follow the Camino route to the village of Lavacolla about 5 km outside of Santiago and then take the N634 for 2 km to airport roundabout. There’s a cycleway from there to the terminal building. There is a good hostel at Lavacolla which is a convenient stopping point if you’ve got an early flight. 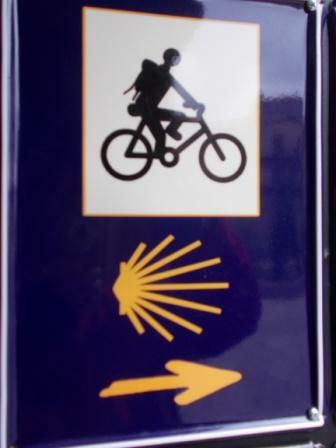 Both the Camino Madrid and Camino Frances routes are well marked with yellow arrows and the shell symbol. The Camino Frances is particularly well-marked, including through towns and cities. 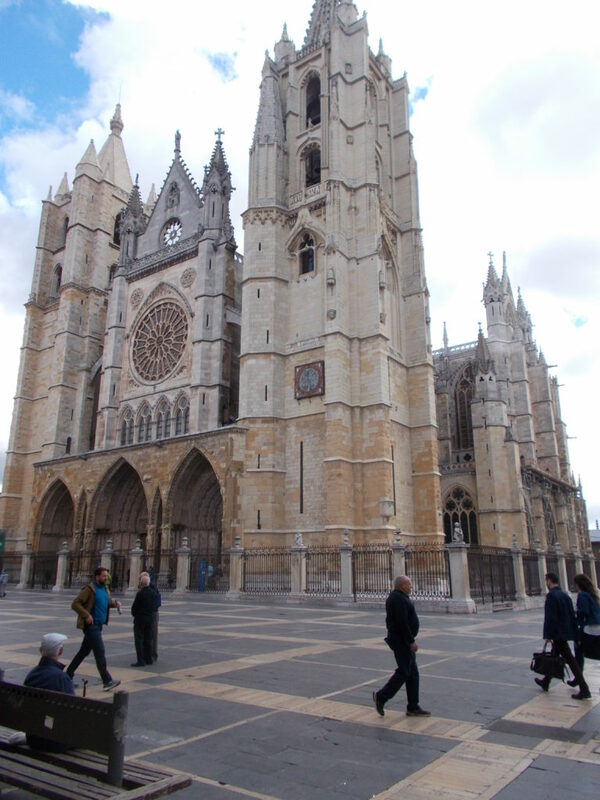 There are many, many guidebooks but all you need is a simple guide to give some idea of different stage lengths and where accommodation might be – this is more useful on the Camino Madrid as it’s far less developed than the Camino Frances. We didn’t bother with a guidebook on the Camino Frances. One of the best sources of information online and guide books is the Confraternity of St James. Loads of info about all of the Camino routes and also some thoughtful reflections on the nature of pilgrimage. Michelin 1;400,000 road maps are adequate, given the good standard of marking of the route. Camping – there are suprisingly few campsites on route and those that there are generally don’t open until June. There are opportunities for wild camping , more in the Galicia section than the Madrid to Sahagun section. Albergues – on the Camino Madrid the main villages on the route have albergues, listed in the CSJ guide mentioned above. Sometimes they can take a bit of finding so the guide helps or a bit of basic Spanish. Costs range from 5 -10 Euros per night. On the Camino Frances there are albergues everywhere so it’s never difficult to find one. The majority of the route descibed is off-road but is non-technical. We used MTB bikes with 2.00 inch light off-road tyres which was an ideal set up on all types of tracks. A road touring bike with 32mm tyres would be hard work on the sandy sections and uncomfortable on the rocky parts of the trail.